A ball could save you from natural disaster. It is known as survival capsule. Engineer Julian Sharpe was motivated by the recent Tsunamis occurred in Indonesia and Japan. This capsule is airtight. It has the ability to float in the water easily. The aluminum shell in the ball is impenetrable. It can hold up 16 people depending on the model. It is available at the affordable price of 13,500 USD. 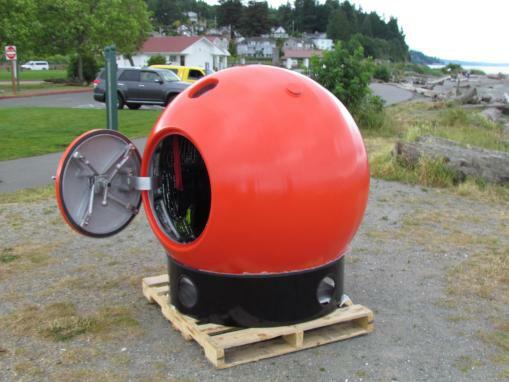 It is a patent-pending, personal safety system (PSS) designed as a spherical ball to protect against tsunami events, tornadoes, hurricanes, earthquakes, and storm surges. Using a PSS, as opposed to a municipal safety system like a safe house, allows individual groups and families to be more in control of their survival in an emergency situation. The capsule is also a variable disaster solution, which means it can vary position according to the water depth, so it will never be inundated by water levels rising too high. It also provides warmth, safety, and shelter during the initial post-disaster period before rescue crews and relief workers have arrived on the scene. The capsule is designed to be mounted inside or outside the home or business establishment. The capsules come in various sizes ranging from two-person capacity all the way up to a ten-person capacity. The smaller capsules are suitable for private dwellings and family homes. The larger capsules are designed for municipal buildings, businesses, hospitals, airports, schools and general public safe havens.